If you don’t know the name of Paul Korda, you might have reason to be grateful that the compilers at RPM Records do! Korda’s story is one dotted with familiar personages: P.P. Arnold, Roger Daltrey, Chris Spedding, Madeline Bell, Doris Troy, Andrew Loog Oldham, Onnie McIntyre and Alan Gorrie (Average White Band), Vic Smith (The Jam) on the musical side, Cat Stevens and even Johnny Depp on the personal side. Korda’s career has taken him from the original West End cast of Hair (alongside Paul Nicholas and Marsha Hunt) to the silver screen in the first two Pirates of the Caribbean films, but a lasting legacy has been his 1971 debut album Passing Stranger. Originally released on Gordon Mills’ MAM label, also the home of Gilbert O’Sullivan, the album was well-received upon its release but has languished ever since, with only a Japanese release in the CD era. 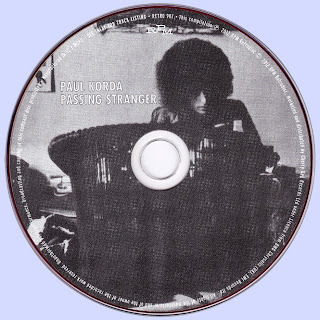 Thankfully, RPM has remedied that with its new, expanded reissue of Passing Stranger. Paul Korda’s musical apprenticeship was a diverse one, including stints as a singer for the U.K. Columbia label, a producer at Fontana and Parlophone/EMI, and a staff songwriter for Immediate Records, the label owned by Rolling Stones impresario Andrew Loog Oldham. A detour into musical theatre led to a success with Hair, but songwriting still called to Korda. After forming the fusion-rock group Dada (with Elkie Brooks among its members) and recording with Dada for Atco, Korda signed with MAM and decamped at London’s Olympic Studios to record the album that became Passing Stranger. The backing vocals of Doris Troy and Madeline Bell (both established vocalists in their own right and also famed for their contributions to Rolling Stones records) add mightily to the leadoff single, “Between the Road.” The presence of Troy, Bell and Nanette Newman give the song a distinctly soulful vibe, and Korda’s full-throttle attack led the NME to favorably compare it to the music of Hair, and his more aggressive side also comes out on the rocking “To Love a Woman” and the raw “Into Your Station.” On the other end of the spectrum, ballads like “Morning Wakes the Sun” and folk/rock songs like “Ode to the Ministry” recall the best of Cat Stevens, a friend of Korda’s. There’s even a Beatlesque lilt to “Pass Me Winter” and a gentle, melodic “We Are Each Other” that’s not too far off from the singer/songwriter style of James Taylor. Chris Spedding, Onnie McIntyre, Alan Gorrie, Andy Roberts and Ray Russell all perform on the album, recorded by co-producers Korda and Vic Smith. Two bonus tracks are included on Passing Stranger, “English Country Garden” was the non-LP flipside of “Between the Road,” while the haunting, baroque-styled “Seagull” (also covered by Love Sculpture) was released on Parlophone in 1969. “Seagull,” recorded at Abbey Road and subtitled “The West Coast Oil Tragedy,” is particularly fascinating in revealing Korda’s prescience about ecological matters. Simon Murphy has remastered the album, and Michael Heatley contributes detailed new liner notes. The booklet is illustrated with copious label photos and memorabilia reproductions. All song by Paul Korda except where stated.